2017 was definitely my “Year of Bread”. The sourdough starter I established in the summer of 2016 was thriving. I shared the starter with several friends and made spinoff starters in whole wheat and rye. In 2017, bread baking became part of my weekly routine. It looks like 2018 will continue the trend. Sourdough makes regular appearances, but, for variety, I’ve been making some breads with commercial dry yeast too. 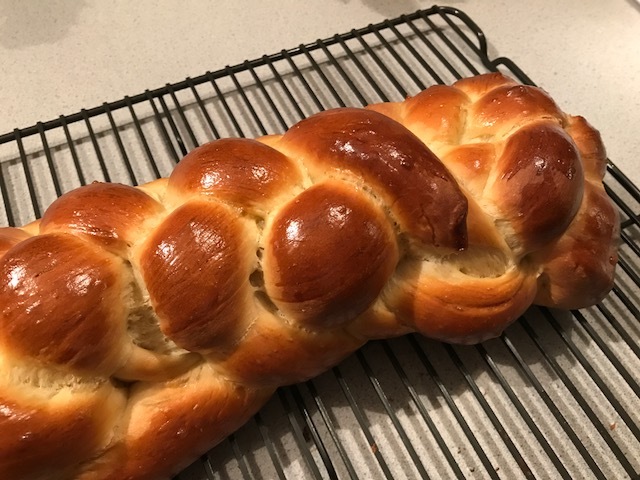 I made a 6-strand braided challah with King Arthur Flour’s January Bakealong. I also tried my hand at Anadama bread after having it at our newest favorite breakfast place. 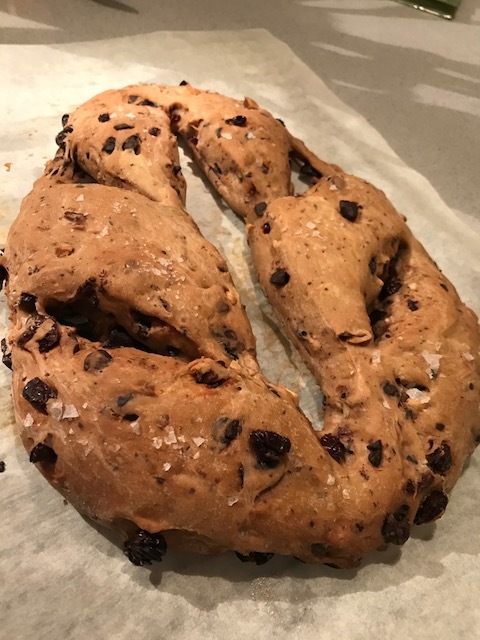 Add the Chocolate and Dried Cherry Fougasse for Cook the Book Fridays to the list. With the sourdough loaves, I need to plan ahead to leave time for feeding the starter, plus I almost exclusively make no-knead loaves which require a LONG rise time. No instant gratification on that track. In comparison, the fougasse took no time at all. The basic dough was simple, as you might expect: flour, yeast, water, olive oil, and a little sugar. It’s the mix-ins, a blend of chocolate, dried cherries, toasted hazelnuts, and some orange zest, that make this interesting. 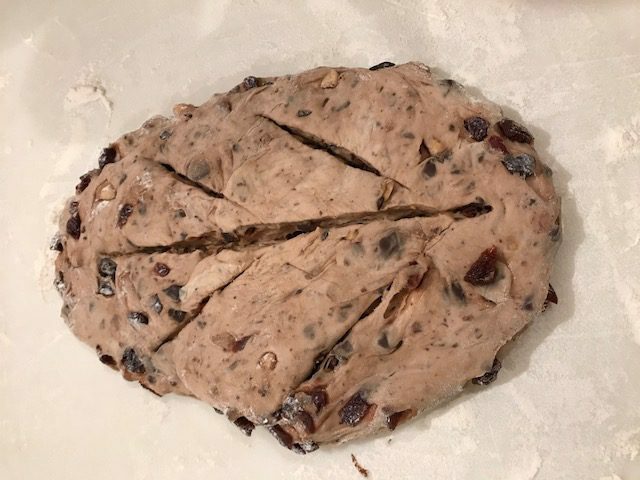 With fruit in the mix, I knew Howard wouldn’t be sampling, so I halved the recipe and made just one loaf. I was a little concerned that there wasn’t quite enough dough in the stand mixer to knead. 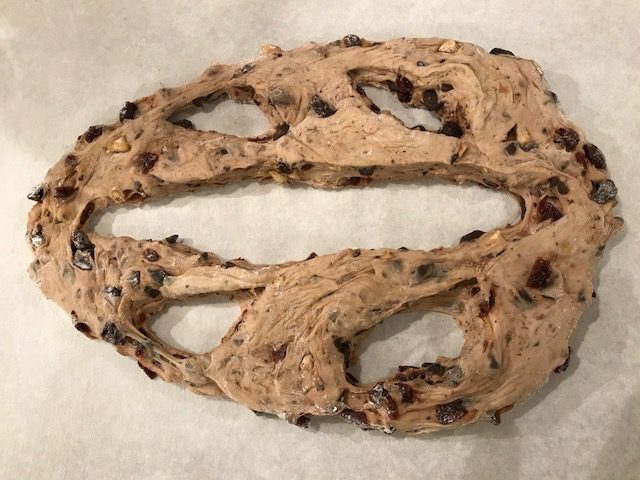 It took a while, but eventually the dough hook brought it all together. After the initial rise, the dough is shaped into an oval and sliced to resemble a leaf before rising again. It stretches out when you transfer to the pan. Just before baking, the loaf is brushed with olive oil and sprinkled with flaky salt. I had to bake my loaf about twice as long as instructed before it lost its raw look and started to brown. Tearing off segments, this bread made a wonderful snack. I enjoyed the flavors and can imagine other combinations of fruits and nuts that would be equally delicious. Or maybe just chocolate and nuts so that Howard could enjoy it. I’ll admit that I was ambivalent going into this recipe, but it surprised me. I’m glad I made it after all. You can find the recipe on page 266 of David Lebovitz’s My Paris Kitchen. To see how my Cook the Book Friday friends enjoyed this recipe, follow their links here. Happy March! It sure has come in like a lion. 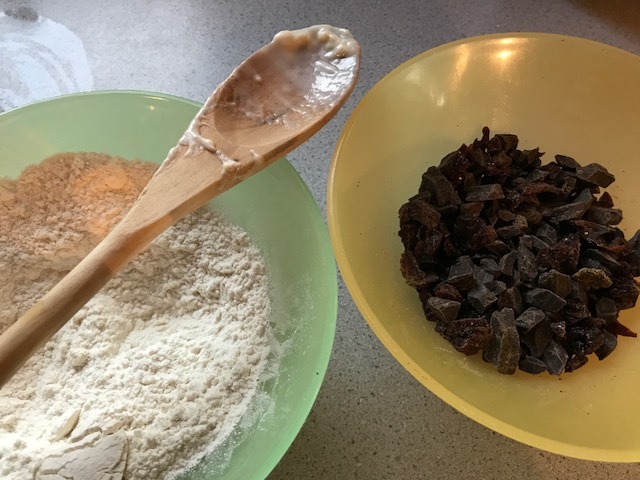 Posted on 2 March 2018, in Baking, bread, Cook The Book Fridays, my paris kitchen and tagged bread, Cook The Book Fridays, my paris kitchen. Bookmark the permalink. 7 Comments. Your bread looks wonderful!! I like your idea of nuts and chocolate for Howard. I did like this, Suprisingly more the next day. This was a fun bread to try again with a different direction. Though it made me want to make a savory one again soon!! Hope you are cozy back there!!! Your bread looks so perfect, and the color is gorgeous. I had to leave mine in a bit longer before it looked well baked, but all is well and I thought it so delicious. Hello. This bread looks fantastic. I have always been interested in making bread, but it always seems I run out of time. I think your motivation is helping me get motivated to explore. Those flavours would be amazing. I like sweet flavours in bread. Beautiful bread I forgot to put the salt on the bread before baking and my yeast was old so it did not rise so nicely as yours. All the same a very nice taste. I’ve really appreciated your sourdough guide, Betsy, though I haven’t been posting the results of my bread-baking lately. This bread was lovely and was a hit at my board meeting!